Additional Cardholder – Most credit card accounts allow the card holder to authorize another person to use the account and have their own separate card that is tied to the same account. The primary person is ultimately responsible for the account, including making payments and the consequences of missing them. Annual Fee – A fee charged yearly for upkeep on the credit card. These fees are more common in secured cards, credit cards for bad credit and cards that offer special perks such as airline miles. APR – The Annual Percentage Rate in credit card terminology is an easy way to reference and compare the interest charges from one credit card to another. The actual amount applied every month to the credit card balance is this percentage rate divided by 12 or possibly a more complex calculation. Authorized User – See Additional Cardholder. Available Credit – This is the amount of money that can be charged onto the account and is calculated by taking the credit limit and subtracting the amount currently owed. Balance to limit ratio – Part of one’s credit score, the Balance to Limit Ratio looks at how much credit someone is using and compares it to how much of that credit is available. While there are some extremes, most of the time the higher the amount of credit and the lower the balances helps improve the credit score. Card Member Agreement – The card member agreement is the contract between the credit card issuer and the card holder and is required by federal law. It is binding and must include the APR, the formula for the minimum payments each month as well as what fees are assessed and when and the process for resolving disputes. The issuer has the right to modify Card Holder Agreements in writing when they choose and card holders recourse is to stop using their credit card if they do not agree with changes. At that point, they have to still repay the debt but they do so under their original agreement. Charge Back – A Charge back is performed when a credit card holder disputes a charge and the credit card issuer agrees the dispute is with merit. This can also occur if a merchant is not following the rules for their account. Credit Line/ Credit Limit – The maximum amount of money that can be on the credit card balance, including the existing balance and new purchases. Credit Utilization Ratio – See balance to limit ratio. Due Date – In credit card terminology the absolute last day a credit card payment can be received where a late fee will not be assessed. In most cases, payments must clear on or before this day to count as being on time. Finance Charge – The finance charge is the total of interest and fees on a credit card statement. Fixed APR – A fixed APR is an interest rate that will never change without a modification to the Cardholder agreement. Grace Period – The grace period definition is the number of days allowed by the card issuer for the card user to pay their bill and not have any finance charges added to the balance. As of 2009, if a credit card has a grace period, it must be twenty-one days or more. The typical grace period is only granted to purchases and not to cash advances and balance transfers. Minimum Finance Charge – If there is to be a finance charge for the month, this is the minimum amount it will be. Typically set at $.50, if the interest for the small balance on the account is less, the credit card issuer will charge this minimum instead. Minimum Payment – The credit card company will disclose this in the Card Holder Agreement (see above) and it is the smallest payment that can be made on a credit card account to keep the card in good standing. Typically from five to ten percent of the balance, minimum payments have been on the rise from government pressure. Over limit fee – A fee assessed when a credit card holder goes over their credit limit, typically due to interest and penalties placed on the account. Prior to the 2009 federal credit card regulations, card holders could get these fees for charging a purchase when they did not have an available balance to do so. Today, they must choose to have this as a feature on their account. Secured Credit Cards – Secured credit cards require the card holder to make a deposit to an account that is used as collateral for the credit card. 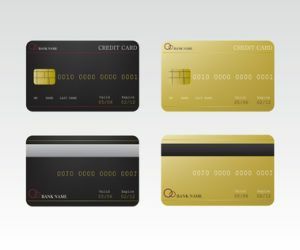 Designed primarily to assist people with no credit or poor credit to help improve their credit scores, there has been some backlash in this market in recent years due to companies in the market taking advantage of consumers who are desperate or uneducated about credit card issues. Terms and Conditions – See Card Member Agreement definition. Unsecured Credit Cards – the most common type of credit card, the unsecured credit card offers the credit card holder credit with no type of collateral, only their promise to repay the debt. Variable Interest Rate – With a variable interest rate credit card, the interest rate has the potential to change from month to month because it is tied to some other interest rate. This second interest rate is known as an index, which is often based on the government bank’s lending rate. While it varies from country to country, the interest rate in the United States that it is based on is known as the Federal funds rate. Currently at historical lows, it has nowhere to go but up and while it has stayed low for a while it could change, adding a bit of risk to those with Variable interest rate credit cards. The disclosure for a Variable rate card will indicate something like “index plus an X percentage rate”.